How Does your Dog Retrieve a Bird? First of all, I should explain myself a little better by starting with, “What are the different types of mouth a dog may have?”  The type of mouth plays a big part in how or if your dog carries the bird back to you on the retrieve and the delivery into hand. The different types of mouth can be broken down in to four categories. 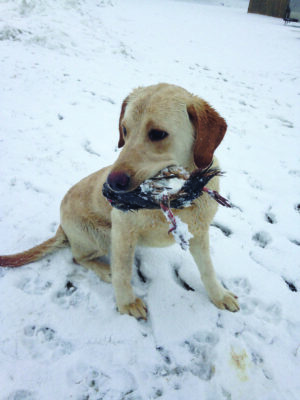 The four distinctions are “soft mouth, hard mouth, sticky mouth, and freezing.”  A perfectly good retrieve is when a dog grabs a hold of the bird in the middle and with a good firm grip brings the bird back in a condition that is fit for the table. A dog with a “soft mouth,” is one that has the bird hanging out of its mouth and it looks like the tongue may be in the way a bit, or he is just hanging on to the bird loosely or a bit sloppily. This is sometimes hard to fix. All dogs have some type of quarks if you will and some are trainable. A dog with a “hard mouth” is one that likes to chomp, chew, or squeeze hard on the bird. “Sticky mouth” means that on the delivery of the bird, the dog does not want to give up the bird. He or she will get “sticky” by not letting go of the bird right away. The owner may have to pull a bit to get the bird out of the mouth and when they do, it will create a tug war problem. “Freezing” simply means the dog will go and get the bird, bring it back to the owner but will not let go at all no matter how much the owner pulls or tugs on the bird! Let’s start with dogs that have a “hard” mouth. One good thing about a dog with a hard mouth is it lets you know that the dog does have some inherent drive for the bird. The dogs natural instinct in the wild is to find the game (or dinner), catch it, kill it, and then bring it back to the den to eat it or eat it right there on the spot. 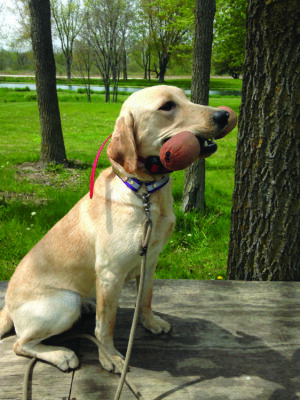 We, the dog’s owner, pack leader or dog trainer, want to curve that appetite or behavior to make that dog pick up the bird and bring it back to hand. It is good to start early in order to avoid a bad behavior. Through “puppy school” or pre-school if you will, you should use a soft canvas bumper for retrieving which may or may not have a bird wing attached with electrical tape. Start the puppy off with something light and easy for them to carry. Find yourself a spot in your house that is like corridor. A good place is a hallway with the doors closed so the only way back is to you. Throw the canvas bumper down the hallway and let the pup go right away. Hopefully, the dog will have enough instinct to go after the bumper and bring it back to you. The key is to not do too many; only a handful or dozen at the most. Leave that area of the house and training with the dog wanting more. If during this exercise, the pup does not bring the bumper back to you, wants to rip or tear it up, then put on a light, long rope to help guide the dog back to your direction. Hopefully, the pup will not want to leave the bumper there and will bring it back to you. This is what I call a “retrieving game.” Be sure to use lots of praise when the pup does a good job. If the dog does not show interest, then you may want to tease the pup with the bumper by dragging it around in front of him and lightly in his face to antagonize and make him want to go after it. Make it fun and interesting for the pup. If the pup does do well inside the house, then do the same outside by using a fence as a boundary or wall. Once the pup become a little older; three to four months or more, then we can use a live bird. I will often start with a pigeon, but there are certainly other options. I like to fold back the wings on the bird in order to lock them together so they do not hit the dog in the face on the retrieve for the very first time. If I see some really good interest and the dog is bold and confident, I will unlock the wings and clip them so if the bird gets away they do not go far. I will do this so that the dog can go on a chase to retrieve that bird. During this whole time, use a long light rope for the pup in order to recall the pup back to you. If the pup picks up the bird and shows a “hard mouth” and “freezes” on the bird, ONE of the ways to make that dog open up the mouth is to curl the gums under the teeth to put pressure on them to make them open up the mouth, then take the bird. There are different techniques that can be used to accomplish this task as each dog is a little different,    Hopefully going through this process will take care of that hard mouth, soft mouth, sticky, and freezing if it can be done the right way. Again, if you are unsure consult with a professional or take your pup there for this training. 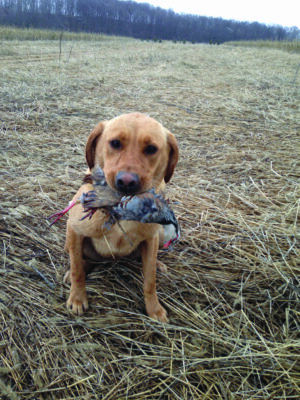 In the months ahead, after successfully accomplishing your goals with your dog, it’s good to keep your dog in check by shooting birds over him or her and having fun with them. There are a lot of places to go on public land and shoot birds. The problem you might face is knowing whether or not there are birds out there in the first place. If you do get out there, there may be other hunters just around the bend, hill, or trees. The unknowing is the hard part. You need to know if your dog will be getting on birds or not. One way to avoid that uncertainty is to join a hunt club. That way you know there will be birds your dog can find in the field. Furthermore, you can have that field all to yourself and can enjoy it with family, friends, and most importantly your hunting partner. It is also a place where you can meet great people with a common interest or be able to show them that first time experience. Remember to practice patience with your puppy and consult a professional if you have questions or are unsure of the next step in your dog’s training.